The Serendipity Trust coordinates a Teacher Training programme which focuses on sharing techniques to promote spoken English for teachers in Sri Lanka. Special attention is given to increasing confidence in spoken English and responding to current needs, as identified by the Department of Education. This Programme is coordinated by the Director of Serendipity Trust, with the annual workshops are developed and led by experienced Teacher Training Consultant who is highly respected by the teachers she works with. The Serendipity Trust works closely with the Department of Education (Southern Province), partnering with them for all training programmes, to ensure the content compliments the local curriculum. We are very grateful for the ongoing support and guidance offered by the Department of Education ( Southern Province). The Training Consultant Ms Mary Yuille has regular feedback meetings with the Department Of Education- Southern Province including discussion and summary of the teacher’s evaluations. These help to plan future workshops and meet the needs and support the concerns of the teachers. • 100 Student Teachers at Amarasooriya Teacher Training College, Unawatuna. • 375 Pre- Service Teachers at Pasdunrata College of Education, Kalutara. • 85 Pre- School Teachers from 45 Pre- Schools in the Galle Zone. The Serendipity Trust is proud of having a series of successful Teacher Training sessions, over the last 6 months. It is estimated that over 800 Government School teachers from 9 Education Zones ( Southern Province) have participated in our workshops. They were all well received. Each is activity based, to use in the classroom to improve the Spoken English of students. The Serendipity Trust had designed and had printed two games suitable to early English learners and 341 Primary teachers received them. They were each given specific instruction and practice as to how to introduce them to the students.The teachers were surprised and thrilled to received them. The Serendipity Trust is very proud, that through the Teacher Training Programme , over 800 teachers have been given the opportunity to pass on new strategies that promote spoken English, to over 3000 Sri Lankan Students. As English is the “Link” language, it is hoped that more fluency will make for a better future. At the request of the Department of Education (Southern Province), this year has seen Serendipity Trust develop workshops for Primary Teachers, as well as workshops for Primary English Teachers. There was also one workshop specially designed for the Secondary School (grade 6- 11) English teachers in Akuressa Education Zone. This workshop is as the title suggests, a compendium of 19 different activities to promote spoken English. Each “TOOL” can be used in the classroom with in allotted 10 minute provision and many allow for creative thought, higher thinking skills, discussion and shared ideas. This workshop was developed to provide an innovative method of getting students to talk. Real objects as collection are a talking point, through sorting by colour, use, material and size. “Open” questions give opportunities for more discussion and detailed answers andguessing game encourage description, thus promoting spoken language. This workshop is an introduction to the way teachers can use simple songs and games to give students a “Taste” of English. Some phonic work is included to help with pronunciation and support understanding of word building and sentence structure. A total of 800 Government teachers participated to the training throughout the year November 2106 – March 2017.The Education Department invited 50 teachers for each training session from each education Zone in the Southern province. 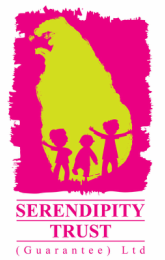 The Serendipity Trust( Guarantee) Ltd has also had the pleasure of coordinating other training opportunities for teachers in the Southern Province and other provinces of Sri Lanka this Year. This includes regular training sessions at the Amarasooriya Teacher training School Unawatuna , introductory training sessions at Pasduanrata Collage of Education Kalutara, and also Teacher Training workshops in Jaffna Education Zone( Killinochchi and Vauniya). At the special request of the Pre-primary school teachers of Galle area, Serendipity Trust coordinated three workshops for Pre primary teachers in Baddegama and Galle. Weekly Sessions-Amarasooriaya Teacher Training School Unawatuna. Since 2014 we have also extended our training workshops to student teachers at the Amarasooriya Training School, Unawatuna. At the principal’s request, the Trust has been conducting sessions every Wednesday and Thursday for the 1st and 2nd year student teachers. 90 students teachers participated in the weekly sessions during the Training season. We were invited by one of the English Language lectures, Mr. Trinidad Hernandez at Pasdunrata College of Education to conduct Training sessions for the Pre-Service teachers. This was an invaluable experience for the Trust's Trainers as these students have yet to begin their teaching careers. At Pasdunrata College, they have had the benefit of innovative and forward thinking ideas from their lecturers, to promote more interactive teaching. The Serendipity Trust team worked primarily with the First Year students who had just returned from a Teaching Practice. She worked with the entire year group of 180 in 3 separate sessions, over 2 days, introducing them to many short and active speaking activities, that can be fitted into each lesson. The students were highly motivated and enthusiastic and the Trust was invited back to provide further Workshops for the Interns, within the month. The Interns were those who are in their final year of training and interrupted their 10 month Teaching Practice to attend. The Serendipity Trust team, worked a further 2 days with the 195 Interns on the subject of Classroom Management in it’s broadest form. This included discussion on Planning, Interactive Teaching methods, Discipline, Rules, and Classroom organisation. The Trust was invited back to conduct further sessions of this nature in the future, and The Serendipity Trust welcomes the opportunity to continue Teacher Training at the Pasdunrata College of Education in the future. In January 2017 the Serendipity Trust proudly supported the Galle Literary Festival in the presentation of a storytelling session for the students’ teachers at Teacher Training School Unawatuna. 80 student teachers and 30 government school teachers participated to this programme and workshop led by Jeeva Raghunath.